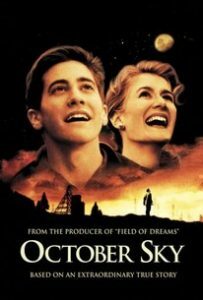 On 5 October 1957, the Russians launched Sputnik, and a 14-year-old boy in a coal mining town in West Virginia began a long journey towards being a NASA engineer. 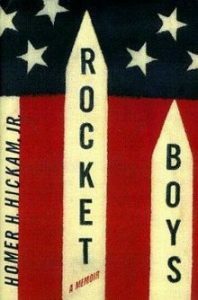 Homer H Hickam Jr’s memoir October Sky, originally published under the title Rocket Boys, recounts the next three years of his life, as he and a small group of friends learn how to build and fly rockets. Between 1957 and 1960, Hickam and his friends scrounge for scrap metal and rocket fuel, study trigonometry, chemistry, and girls, and form the Big Creek Missile Agency (BCMA). Along the way they destroy his mother’s rose garden fence, nearly kill themselves, are accused of setting a forest fire, and fight their school to get a course in offered in calculus. (Calculus? You don’t need calculus to mine coal!) In their final year of high school, these small town, coal miners’ kids take first place in the 1960 National Science Fair for their entry on rocketry. It is, however, about more than just rocketry. The way of life the town was built on was, even then, dying. Hickam’s parents are at war with each other; his father, the mine supervisor, is proud of his work; his mother sees the cost to his father’s health and is determined neither of her sons will work in the mine. That same conflict is reflected throughout the town, and in both the pride and anger the boys’ antics inspire in their elders. In the end, these boys triumph. If they had not had the support of a few good teachers, parents, and even machinists and garbage truck drivers, they might not have. This heartfelt memoir was made into a movie in 1999. Funny in places and sad in others, it adds up to an inspiring story. Audience: adults and teens. Non-violent and clean, except for one fade-to-black scene in the back seat of a Dodge.